After a chilly-yet-beautiful pre-wedding shoot with Josh & Stephanie in Bend, we hit the road for Eastern Oregon and the quest for solitude. There is something completely relaxing about driving into vast, open space, and that was exactly what we were looking for. Our first night found us headed towards the Steens Mountains. 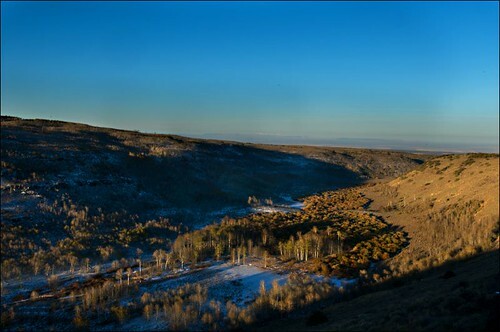 The Steens hold a huge amount of Aspen groves (fairly rare in Oregon), and we were hoping to glimpse some fall color. It turns out that we were greeted with snow instead! It was really cold camping at about 8,000 feet, but it was worth it to experience snow in October! Plus, it added wonderful texture and contrast to the fall landscape. Looking west into Lake Creek Canyon at sunrise. An aspen grove at the bottom of the canyon. After one night up in the Steens, the desert sun of the Southwest started sounding better and we decided to head towards Nevada en route to Utah. 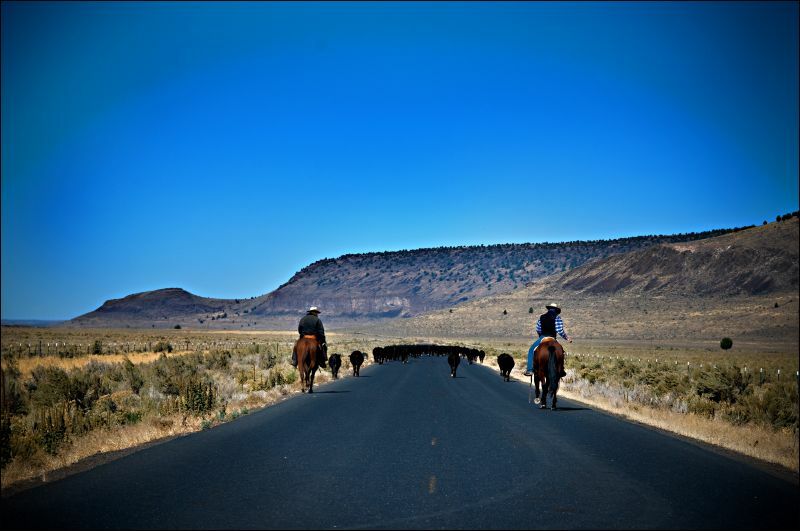 A few hours into the drive, Joelle startled me when she noticed a mirage of cattle seemingly stampeding toward the car. This turned out to be our favorite moment of the day, and the cows were not stampeding, but were being driven to a new pasture down the highway! We did pull off the road in time, however, and gave our regards to the cowboys as they passed. Pretty crazy for a state-highway! Here they come . . .
. . . and there they go.